Archives : BULLISH START TO 2015 - 02/01/2015. BULLISH START TO ‘2015’ - 02/01/2015. It was a strong close to the first week of ‘2015’, as the Nifty hit a century on Friday whereas the Sensex scored nearly 400 points. As a result of this massive rally on Friday, the Nifty managed to close above the critical level of 8372, due to which one can say that the correction is over and the prior uptrend has resumed. Also the short term as well as medium term trend has turned up. Nifty has completed a bullish pattern and as a result the Nifty is now expected to reach 8767 in the near term with big help coming from banking stocks. Bank Nifty too has recorded a bullish breakout and is now headed towards a possible target of 20345. 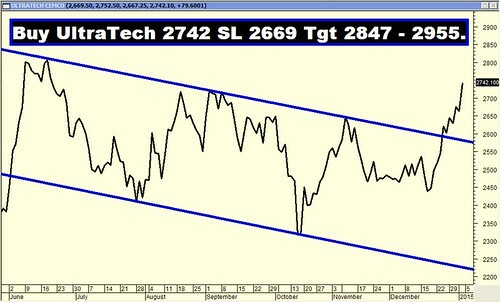 Sensex opened the week at 27266, made a high of 27937, low of 27266 and closed the week at 27887. Thus it closed the week with a strong gain of 646 points. At the same time the Nifty opened the week at 8214, made a high of 8410, low of 8214 and closed the week at 8395. Thus the Nifty closed the week with a gain of 195 points. 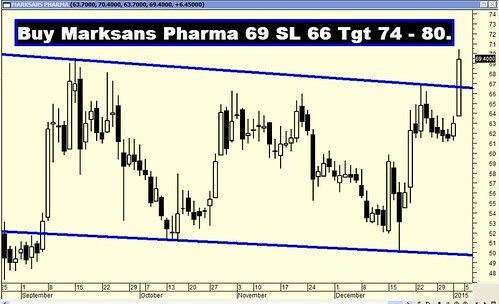 On the daily charts, both the indices have formed a big Opening white body Marubuzo on Friday which has resulted in it giving a bullish breakout. Also the weekly charts have formed a big White body Marubuzo suggesting that the current uptrend is intact. Thus both weekly as well as daily candlestick patterns suggest bullishness to continue. Since the Sensex closed above 27645 and Nifty above 8372, the market is now headed higher as the Correction is now complete and the prior uptrend has resumed. Thus the Sensex and Nifty are likely to march towards its previous life highs of 28822 and 8626 respectively. Both Sensex and Nifty have completed a small bullish Cup & Handle pattern when it closed above Sensex 27851 and Nifty above 8364. As a result of this pattern, the indices are likely to head towards a target of Sensex 29213 and Nifty 8767 in the near term, as long as the Sensex stays above 27091 and Nifty above 8147. MACD and Price ROC have both given buy signals this week. Even RSI crossed the centerline on Wednesday and signaled a Buy suggesting bullish momentum. Stochastic Oscillator continues in buy mode as %K (85) continues to remain above %D. MFI (53) too has signaled a fresh buy on Friday which suggests positive money flow. ADX has fallen to 20, which indicates that the uptrend has lost lot of its strength. Direction Indicators have generated a Buy signal as +DI has gone above –DI. Sell signal given in Bollinger Band has been negated on Friday when the Nifty closed above the mean of 20dma. Thus majority of the Oscillators have turned positive and are suggesting bullishness in the near term. On Friday, both the indices managed to conquer the short term average of 20dma (Sensex – 27491 and Nifty – 8265) and the medium term average of 50dma (Sensex – 27730 and Nifty – 8310), thereby turning the short term as well as the medium term trend up. Also both the indices continue to remain well above the long term average of 200dma (Sensex – 25553 and Nifty – 7641). Thus the trend in the short term as well as medium term timeframe has turned bullish whereas trend in the long term timeframe continues to remain up. Option data suggest highest Put Open Interest is at 8000 whereas the highest Call build-up has shifted to the strike of 8600. Thus Option data suggests a trading range with support coming in at 8000 and resistance around 8600. On Friday there was a surge in Open Interest for the 8400 Put which suggests that this level is likely to act as support.